When it comes to audio, Shure is well regarded as one of the most trusted brands for both consumer and professional gear. The PG-27USB microphone is Shure’s latest USB-powered condenser microphone for professional consumers (prosumers). While it’s a major step down from their more high-end offerings, it’s also a huge step up from built-in laptop microphones. For those entering into the world of professional audio quality, a decent microphone is essential. Whether you’re recording a podcast, dictating a book, or hosting a video conference, isolating external noises is vital. Shure claims to cater to all these needs with the PG-27USB microphone. 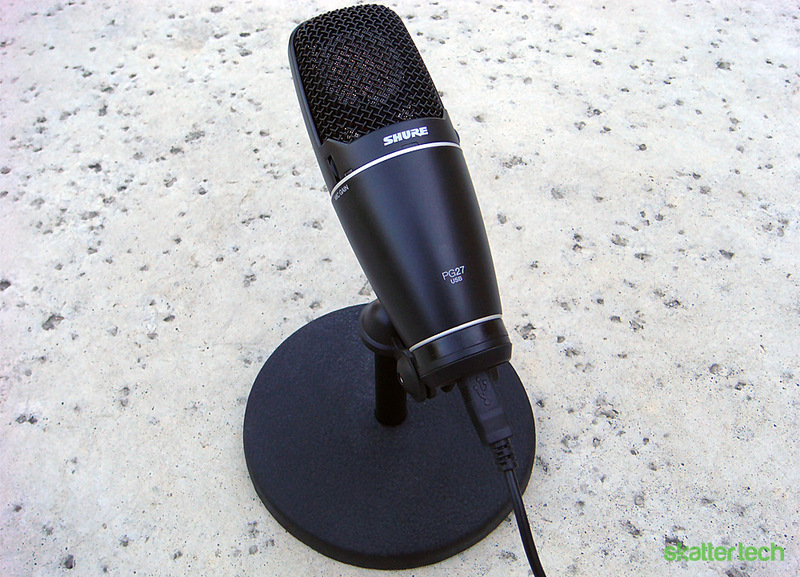 Shure provides almost all the essentials needed to get started using this microphone. 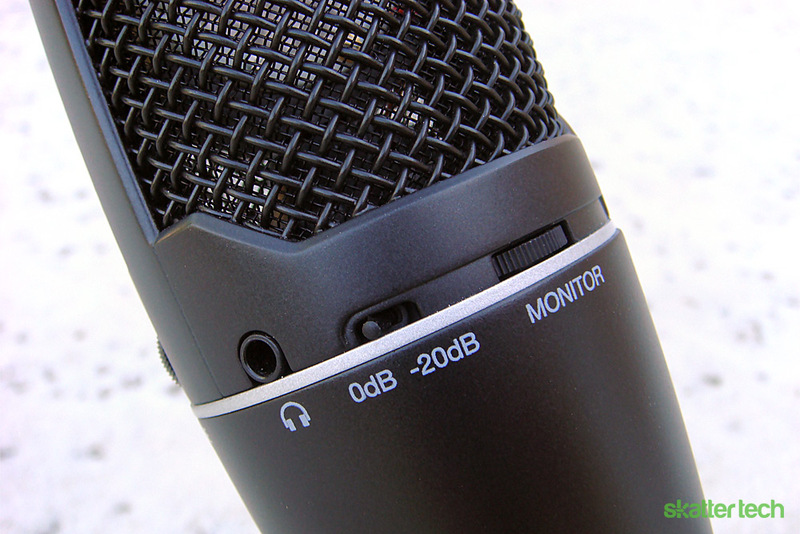 The packaging includes the PG-27USB microphone, a USB cable, and a proprietary mount adapter. An adapter is n included for use with non-Shure mounts. However, there is no stand included. Since the PG-27 can’t be used without one, a decent stand will add at least $15-20 to your purchase. Other competing all-in-one solutions such as the Blue Microphone Snowball or the AKG Perception 120 USB come with adjustable desk stands, so it is a bit irritating that Shure did not include one as well. The microphone is quite robust in terms of build quality. It’s clear that no cheap materials were used. The PG-27 feels solid and is quite heavy, weighing in at just a hair under a pound. It’s heavier than standard microphones due to the additional hardware inside, so a strong mount might be necessary. It’s important not to forget that this gizmo has a microphone, a preamp, and a monitor all packed inside. With that said, the PG-27 should be able to survive a drop or getting knocked down accidentally, due to its sturdy build. The metal grill and casing is thick and doesn’t show any signs of weakness or flex. While I don’t recommend testing durability, reasonable wear and tear won’t be a problem. The PG-27USB includes hardware settings for mic gain, volume control, monitor wheel, as well as a 20dB padding switch. A 3.5mm headphone jack offers a direct monitor line, which is a great way to listen to yourself and make fine tuning adjustments until the audio sounds right. The unit even includes an LED status light with three color statuses: green indicates that audio is in a good range, yellow indicates peaking, and red signifies audio clipping. It should be noted that the PG-27 was released in both XLR and USB models. The XLR version is more suited for those with high-end audio equipment, as it requires an amplifier or a converter for digitizing. For the average person, the XLR microphone requires proper equipment and configuration knowledge. On the other hand, the USB model is an all-in-one package that offers the same quality but can be used with any computer with a USB 2.0 port. 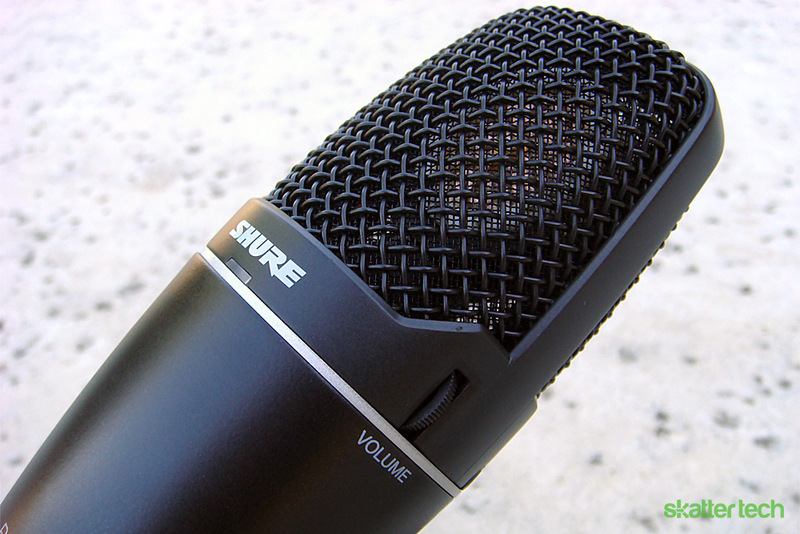 Shure emulates professional audio while making the PG-27 easy to use. Getting started with the PG-27USB was extremely easy. My laptop, running Windows 7, detected the PG-27 and found drivers for it automatically. I didn’t have download any files or use an installation CD, and it was ready to go within a few seconds. 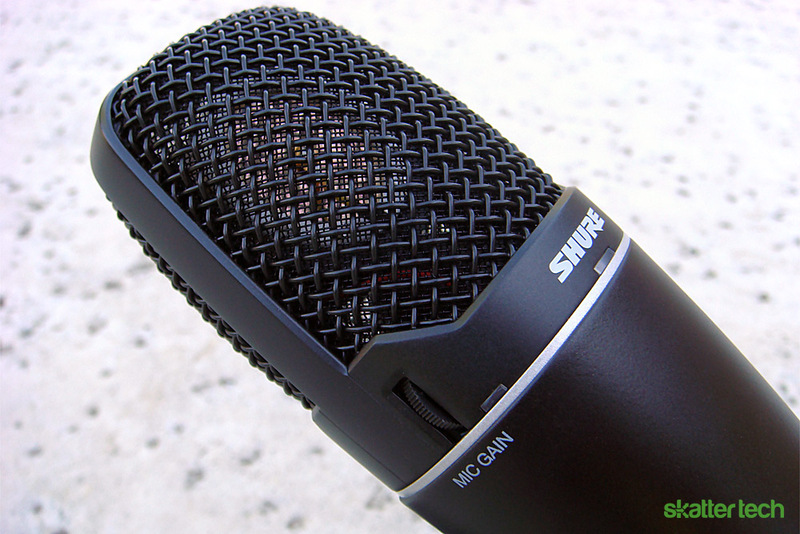 The microphone is also compatible with Windows 2000, XP, Vista, and Mac OS X 1.0 and later. I should mention, however, that I did run into a few problems. Some applications didn’t automatically select the microphone as the primary microphone despite setting it as the default in the Control Panel. Despite those few odd occurrences, installing the microphone was as easy as plugging it in. The PG-27 is without a doubt a huge improvement over an integrated laptop microphone or even a cheap auxiliary one. It’s also significantly better than the Blue Snowball microphone. I have been using the microphone for the past month for everything from Skype calls to narrating instructional videos to experimenting with podcasts. After making some recordings with Audacity, I found the audio quality with the PG-27 to be rich and clean. There’s minimal audio clipping, choppiness, or external sounds. Whether it’s a hard drive rumbling, a computer cooling fan, a rolling chair, or even sounds from a speaker, the Shure PG-27USB can isolate it all. The controls offer plenty of room for finding a perfect comfort level for recording audio. After some refinement, I was able to successfully isolate vibrations and breathing noise. If vibrations are still a problem, it’s compatible with a standard spider mount that should significantly help reduce the issue. Also, the -20dB padding is a great addition for playing loud instruments. Adjusting the gain truly does help intensify the sound, and it begins to pick up just about every noise when turned up all the way. It’s great that this control is offered, while competing microphones such as the AKG Perception 120 don’t include a hardware control for it. Overall, I was quite impressed with the Shure PG-27USB microphone. The company has created a great device for the prosumer market. Without having to purchase and amplifier, a condenser microphone, and additional interfaces, Shure’s solution includes it all. They even include a USB cable for getting it instantly set up and running. A carrying case makes a great travel addition. While I was a bit disappointed with the lack of a mini tripod-like stand, it’s simply too expensive to get a 3rd party solution. When it comes down to it, the PG-27USB offers professional-like audio quality in an easy-to-use package. Anyone who has the cash to spend can get started with minimal effort. Whether recording an instrument, podcasting, singing, or just video chatting, the microphone improves it all. While the $200 MSRP is a bit expensive, it goes for as low as $140 through retailers, including Amazon. And for that price, it’s definitely a great deal that won’t disappoint. I love this mic. I do wonder if the PG42 would have been a better mic. Thanks.